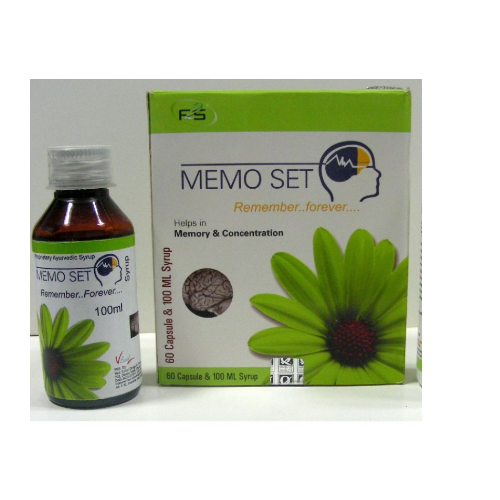 Brain Tonic - MEMO SET - Herbal Brain Supplement - MEMO SET is available in both capsules as well as syrup form. These are based on 100% herbal formula that provide effective support in improving memory and increasing concentration capabilities. Shankhpushpi ext., Mandook parni ext., Brahmi ext., Jatamansi ext., Jyotishmati ext., Mulaithi ext., Vacha ext. Ayurvedic Brain Capsules, Brain Booster Capsules, Brain Syrup, Brain Tonic - Memo Set, Herbal Brain Capsules, Herbal Brain Tonic, Herbal Memory Booster Capsules, Memory Booster Capsule, Memory Improving Capsules, Tonic For Good Memory, Memory Enhancer Syrup, Memory Enhancer Capsule, Ayurvedic Memory Booster Syrup, Ayurvedic Brain Capsules, Ayurvedic Brain Memory Capsules, Brain Booster Capsules Exporter, Brain Wise Syrup Exporter, Herbal Memory Syrup Exporter India, Herbal Memory, Memory Booster Tonic Manufacturer, Memory Capsules Manufacturer, Memory Capsules Syrup India, Memory Gain Tonic Memoset, Memory Improving Capsules And Syrup Manufacturer, Memory Increasing Syrup Manufacturer, Memory Increasing Syrup Manufacturer, Memory Plus Herbal Memoset, Memory Tonic Manufacturer, Memoset Herbal Memory Syrup, Memoset Syrup Suppier, Tonic For Good Memory Syrup India, Tonic For Good Memory, Vxl Brain Power Capsules Syrup, Vxl Memoset Syrup Supplier.